God Bless 'merica! One of the many intriguing films announced in Toronto Film Fest's line-up today was Midnight Madness entry God Bless America, from by actor-comedian-filmmaker Bobcat Goldthwait, who directed the indie classics World's Greatest Dad, Sleeping Dogs Lie and Shakes the Clown. We know the TIFF site is full of photos, but we owe SlashFilm the tip for pointing out that two new photos from God Bless America are now in the gallery. Below are the first two shots of Joel Murray and Tara Lynne Barr as two people who go on a killing spree in Goldthwait's "angry and bloody" black comedy. Check them out! Final photo comes from TIFF's Colin Geddes, @MMadnessTIFF, as he tweeted this photo earlier today.Joel Murray) has had enough of the downward spiral of America. With nothing left to lose, Frank takes his gun and decides to off the stupidest, cruellest and most repellent members of society with an unusual accomplice: 16-year-old Roxy (Tara Lynne Barr), who shares his sense of rage and disenfranchisement. From stand-up comedian and director Bobcat Goldthwait comes a scathing and hilarious attack on all that is sacred in the United States of America. This sounds like it's going to be insane, hilarious and brutal all at the same time, which I'm totally down for. Thanks again to TIFF.net. If you search through the Midnight Madness twitter feed (@mmadnesstiff:twitter), you will find a third (and more bloody) photo from the film. This film is definitely this year's SUPER (when it comes to bloody dark comedies in the Midnight Madness round-up). It's Falling Down for the recession! Not a joke, that's one of my favorite Micheal Douglas films, and I'm hoping for the best for Bobcat & Joel. Perhaps the 'Beef Supreme' of the Murray clan will finally get some recognition. i was thinking of the same comparison (to "falling down"). i loved that movie too and can't wait to see some kind of trailer on this. Definitely similar to Falling Down(love that movie), I just hope someone who sees this won't do this in real life! What do you mean by beef supreme? Beef Supreme is a memorable character in Idiocracy, an independent movie my Mike Judge, played by Andrew Wilson. Andrew is the elder brother of Luke and Owen Wilson, and while he's nowhere near as famous, just as talented and funny as his brothers. Likewise Joel Murray is the younger bother to Bill and Brian Murray, two very famous (although Brian is a character actor) actors. Yes there is a 4th Murray, John (from Moving Violations and Scrooged); however Joel has a much 'beefier' resume and frequents his elder brother's movie more often. 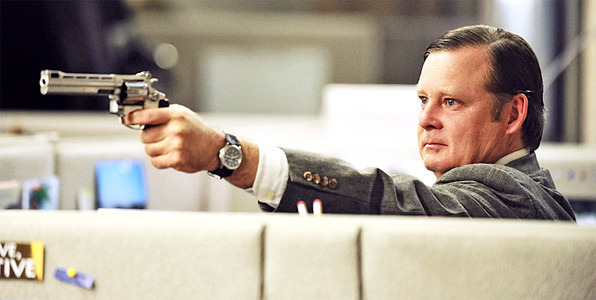 I fell in love (well, sort of) with Joel Murray in Shameless. Definitely looks interesting! There was never a moment in Falling Down that I wasn't thinking that's Michael Douglas playing a role with a bad hair cut. Big names have to be amazing to let you forget that the character isn't the star you know.